Home » Launch of Nyamiyonga- Katojo Water Supply System in Isingiro District. H.E. 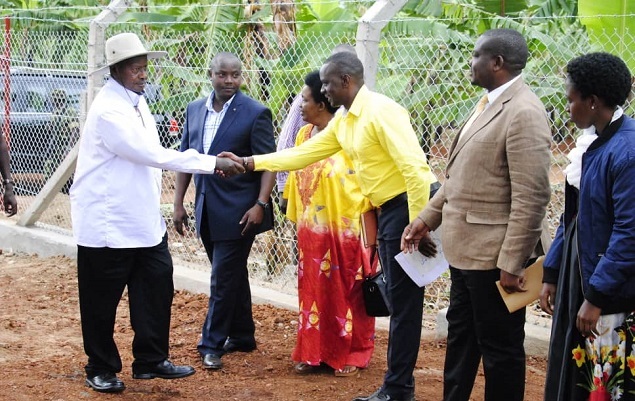 President Yoweri Kaguta Museveni visited and launched Nyamiyonga- Katojo water supply system in Isingiro district. The area has been prone to water shortage, especially during drought spells, affecting both domestic and agricultural activities. The Government of Uganda through the Ministry's Rural Water Supply and Sanitation Department will supplement these schemes by supplying 30,708 homes in 25 villages by getting water from River Kagera extending water to the entire district. The State Minister for Water Hon. Ronald Kibuule welcomed His Excellency at the launch of the water system. Others present were Ministry of Water and Environment Officials, Politicians and the Community members.